BIRN Serbia, in cooperation with NALED, presented a mixed picture of the government’s first one hundred days when they announced the results of their joint monitoring of government efficiency in key areas on November 2. 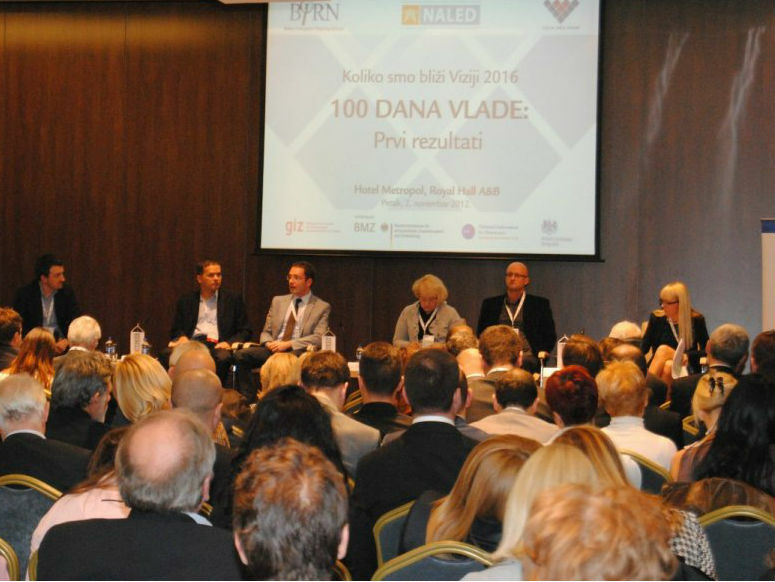 The Balkan Investigative Reporting Network, BIRN Serbia, in cooperation with the National Alliance for Local Economy Development, NALED, presented the results as part of BIRN’s project “Policy-based Accountability Tool for Monitoring Government Performance”. The project aims to determine the legislation and other measures adopted by the government and their influence in practice and on citizens’ lives in five key areas: public finances, economy, anti-corruption, health and education. The report, “The First One Hundred Days of Government”, says most success was achieved in the reform of public revenues and spending with the abolition of 138 taxes. However, participants at the conference in Belgrade said the government had not done enough. Ernst Bode, board member of NALED, said many problems still hindered businesses in Serbia, adding that the government still interfered in all aspects of the economy. “Complicated and unclear procedures are still a huge problem. Laws and bylaws are either outdated, completely unnecessary, unenforceable or unclear – and sometimes implementation requires enormous efforts but gives very little results,” Bode said. Nemanja Nenadic, programme director for the watchdog organisation Transparency Serbia, said the government had the right intention as it worked to fight corruption in the field of public procurement. But he warned that corruption in the biggest procurements still went unpunished. “Unfortunately we deal with peanuts,” he said. He added that the fight against corruption should not be left to individual ministers but was a task for the government as a whole. Sasa Randjelovic, assistant at the Faculty of Economics in Belgrade, said that during and after the elections little attention was devoted to the educational system and all that has been done in the past few months has been in the area of fiscal consolidation. He added that implementation of compulsory secondary education should be considered, while in higher education the quality of interaction with students should be improved and students should be sent abroad for specialization. Although the government has undertaken various measures in the field of fiscal consolidation, experts at the conference agreed that without root and branch structural reform there will not be substantial impact, or much improvement in living conditions in Serbia.